Improving Lives, One Smile at a Time! Choosing orthodontic care is choosing to make a lasting, wonderful improvement in your life. Straightening your teeth improves your bite and oral health and boosts your self-esteem. You’ll finish with a beautifully confident smile you love to share! If you’re ready to improve your life by changing your smile, Orthodontic Centers of California would love to help! Our orthodontists, Dr. Agopian, Dr. Babayan and Dr. Budiman provide individualized care. When they create your unique treatment plan, they’ll consider your clinical situation, oral and overall health, and facial aesthetics. They’ll also work with you to understand your personal goals and concerns. Together, you’ll decide on the approach that delivers the smile you deserve in a timely, affordable, and comfortable manner. We promise to keep you engaged, informed, and excited about changing your life! Along with our remarkable team, our doctors have created an orthodontic practice that’s welcoming, friendly, and fun. Each of us goes to great lengths to ensure you know you’re in excellent hands and we’re here to serve and support you. We truly believe everyone deserves a smile that’s healthy and beautiful, and allows one’s personality to shine through. 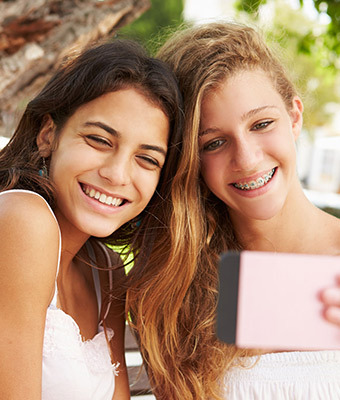 Orthodontic Centers of California offers state-of-the-art technology, advanced techniques, the essential human connection, and an emphasis on customer service. We never forget the person we’re creating the smile for; we respect and celebrate your individuality. Starting with your complimentary consultation, we’ll talk about your life and activities, along with your clinical and personal desires. The more we know about what you need for treatment, the better the doctors can tailor your experience! Making the decision to straighten your teeth and improve your life with a new smile is a commitment to your future. It’s our responsibility to make the process stress-free. From our three locations to early-morning, later-evening, and Saturday hours, we make treatment accessible. We also accept many insurances and offer a range of payment and financing options. We’ll work with you to make your confident, life-changing smile happen! Contact our Porter Ranch, Canyon Country, or Granada Hills, CA office and schedule a consultation today. No high-pressure sales pitch, we promise: We’re excited to improve your life with a new smile and will provide all the information you need to make an informed decision!